The United States is blessed with a number of good pistolsmiths. Many take justifiable pride if they achieve recognition as Master Pistolsmiths. When a pistolsmith builds his endeavor into a multi-million-dollar-a-year business employing almost 50 full-time employees and sparks the creation of a cottage industry based on the venerable 1911 pistol, then titles like "titan" or "icon" are worthy of consideration. Bill Wilson of Wilson Combat has entered this rarified atmosphere of special achievement. Before we get into one of his current projects, let's take a quick look at Bill's background. Wilson Combat's polymer-frame 1911 looks and feels right. The slightly larger grip frame is still manageable by most shooters, except those with very small hands or short fingers. Bill's a pretty young guy considering that he began working on handguns more than 30 years ago. I can say that because I still think of myself as being a pretty young guy (everything is relative), and I'm older than Bill. He actually began in 1974 doing custom work on revolvers, but in 1977 he started customizing 1911s for competition and, as the saying goes, never looked back. His early work on 1911s led to the incredible IPSC race guns seen in the '80s. He started manufacturing and marketing his own pistol parts in 1981, an activity that remains successful today. Late in the '80s he again began customizing revolvers for hunting and self-defense use. As a handgun hunter, I was impressed with both the looks of his hunting handguns and the practical thinking that went into them. In 1996 he began making complete 1911s along with custom leather gear, and in 1999 and 2000, respectively, he expanded his attention to include scatterguns and the AR family of rifles. When his focus shifted from competition to self-defense and law enforcement in 1996, he became an instrumental force in forming IDPA. Headquarters of the Wilson Combat empire today comprises four main buildings that enclose about 15,000 square feet and 46 employees. More than half of these folks are trained pistosmiths with experience ranging from one to 19 years at the company. With more than 30 years of experience in producing some of the world's highest-quality 1911s, Bill is fully qualified to lead his team through example. Even in his chosen leisure-time activities, Bill is a bit awe-inspiring. The Wilson CQB (left) has a reduced-size grip and frame, while the Professional (right) has a full-size grip and shortened barrel. Accompanied by a good flashlight and knife, both are fully qualified for street duty. Besides organizing and formalizing practical handgun competition, he is himself a world-class competitor. The guns he builds for these events are not the result of tenuous theory resulting from heavy doses of late-night caffeine but rather the practical results of what has been exhaustively tested on the field of competition. If your interests are oriented more toward hunting than competition, "No worries, mate." Bill has extensive hunting experience on numerous continents using handguns and rifles modified by the talented hands of Wilson Combat's trained 'smithies. But let's get to the subject of today's treatise. One of the hot products in today's handgun industry seems to be polymer-frame handguns. A number of companies are, or have been, engaged in the manufacturing of such handguns, including variations based on the 1911 platform. These polymer 1911s have wide-body frames utilizing double-stack magazines to maximize the number of rounds the gun can carry. Polymer frames do result in a significant weight savings, but nobody seems interested in doing a single-stack polymer 1911 frame. I don't know if this is due to a feared backlash from 1911 devotees demanding that the perpetrators of such a gun be burned at the stake or because manufacturers don't see a market for single-stack plastic 1911s. Whatever the reason, 1911s with non-metallic frames have all featured double-stack magazines. The advantage of such a gun is that it will hold an increased number of the quintessential defensive cartridge, the .45 ACP. The downside is that it alters the ergonomics of the most popular defensive handgun of all time, the single-stack 1911. Wilson Combat has entered the polymer-frame, wide-body 1911 race and has addressed this issue along with a few others in an elegant offering, and I never thought I'd use that adjective in describing a "plastic" handgun. At the risk of oversimplification, I would say the major difference between production handguns and custom handguns is that production guns are assembled, whereas custom guns are fitted. Delivered with the gun (and every Wilson Combat custom pistol) is a quality-control checklist that delineates more than 70 specific fitting, assembly and inspection steps taken to ensure correct fit and function of all components. These are initialed by one of the 'smiths or supervisors at the shop. Many of these steps address actual dimensions and tolerances that had to be held/met before the gun could be accepted. In the "test fire" section, particular attention is paid to the proper functioning of the first and last two rounds of both eight- and 10-round magazines using hardball, hollow-point and lead semi-wadcutter ammunition. In fact, all Wilson handguns are test-fired a minimum of 58 times before being accepted. If there is a single failure at any point during the 58-round test firings, the gun must be reworked and the entire 58-round test program must be begun again. Bill is quite proud of his QC program and credits his inspection procedures with the fact that returns are at an all-time low, and that covers a span of almost 30 years. The external extractor on the KZ tested will be replaced by Wilson's standard internal extractor on future guns. Other excellent features like the sturdy combat sights, high beavertail and grip-safety bump will remain the same. Because the KZ was designed from the beginning as an 11-round pistol (10 in the magazine and one in the chamber) rather than as a 13- or 14-round gun, it was possible to minimize the grip dimensions. In fact, despite its double-stack configuration, the KZ is no wider than a single-stack 1911. Wilson's high tactical safety is easily reached and easy to operate. The beavertail sweeps above and past the hammer, ensuring that the KZ will not "bite the hand that feeds it." Comparative specs on the KZ and a single-stack 1911 with an eight-round magazine show the width of both being 1 5/16 inches, with the empty weight of the KZ being 31 ounces compared to 39 ounces for a five-inch-barreled steel gun. In addition, the base of the KZ's polymer frame is flared slightly for a super-comfortable grip, and the magazine well is beveled to facilitate fast reloads. The mold for the polymer frame provides 18-lpi checkering, both on the frontstrap and on the flat mainspring housing. The result is a surface that gives excellent control with no need to reacquire one's grip during rapid-fire strings. As you would expect, there are numerous other features that come standard on the KZ. The match barrel is stainless steel with a polished and throated feed ramp and, as stated on the check sheet, is hand-fitted to perfection. The ejection port has been lowered to enhance reliability and an external extractor installed. It should be noted that future KZs will have internal extractors like Wilson's single-stack 1911s. In fact, slides for single-stack Wilson 1911s will be identical with slides on the wide-frame models. The KZ's stainless steel slide has cocking serrations front and rear. The gun features a #455 speed hammer, an extended tactical thumb safety and a high-ride beavertail grip safety. It is also equipped with #463 tactical combat tritium night sights. Finally, the KZ is completely dehorned, an important attribute when practical conditions triumph over aesthetic considerations. All of this, accompanied by two 10-round magazines, is delivered to you in a nylon Wilson pistol rug for $1,325. If you're not familiar with Wilson pistols, you might be a bit skeptical when you see the target that accompanies each gun. I've had three Wilson 1911s come into my possession for varying degrees of time, and the three targets all looked the same. Each consisted of one big, jagged hole fired at 15 yards, not in a Ransom rest but by one of the pistolsmiths at Wilson's. (For the record, during a recent visit to Wilson Combat I witnessed the test firing of a finished 1911 from a rest and can verify that those big, jagged holes are achieved by a hands-on shooter firing at 15 yards.) All three guns had combat night sights, not the precise adjustable sights normally seen on target guns. "Look, Mom, no guide rod!" The KZ's accuracy and reliability clearly demonstrates that such a device is not necessary. First thought is that such accuracy is not expected in, nor required of, combat/carry guns. In fact, it's a widely held belief that getting this kind of accuracy requires a sacrifice in reliability. Wilson Combat regularly demonstrates that this widely held belief is no longer valid. In the two guns through which I have fired a few hundred rounds, there was not a single malfunction regardless of the type of ammo fired. I'm not saying I can duplicate factory-demonstrated accuracy, but I have been quite impressed with the accuracy I did achieve. Case in point involves a recent turkey hunt at the White Oak Plantation in Alabama. Alabama is one of the few places where you can hunt turkey with a handgun (iron sights only). Since spring turkey hunting is frequently conducted in wet weather, I took the stainless/polymer KZ for foul-weather conditions. The KZ's accuracy was outstanding. The Hornady ammo (left) kept five shots in something over an inch, with four shots going under an inch; the Black Hills lead semi-wadcutters (right) were dead on and right at one inch; while a composite group of five different factory loads held 10 shots under two inches. I had not fired the gun prior to arriving at White Oak but had confidently selected Black Hills 200-grain lead semi-wadcutter loads as my game-getter of choice. The first two shots I fired from the KZ were taken offhand at 25 yards on a life-size turkey target. I aimed just below the junction of neck and body and put two rounds about a quarter of an inch apart exactly where I wanted them. With two of the White Oak guides watching, and knowing I could not continue that level of performance, I declared the gun officially sighted in and offered to let the other attendees have a go. Approval of the KZ was unanimous. To be honest, I didn't really want to retire that early, but it was one of those magic reputation-building moments that don't come along all that often. Unfortunately, the fairy tale ended two days later with me wounding a turkey (using a different gun) and losing the bird in the heavy woods--ah well, two days as a hero and the rest of the year as a goat. came to hand with absolutely no sense of searching for the right grip. Trigger pull is a crisp and repeatable four pounds, which was comfortable for longer-range precision shots as well as close-range rapid fire. When I actually got around to "formal" accuracy testing, the weather failed to cooperate, so the venue changed from shooting outdoors in bright sunlight to firing offhand at an indoor range under rather dimly lit conditions. The lighting was bright enough that I could see the sights but dim enough that my aging eyes could not bring them into clear focus. There was, however, enough light that the Trijicon night sights were not a factor. As it turned out, my choice of the Black Hills 200-grain lead semi-wadcutters for the turkey hunt at White Oak was prophetic. Not only did this ammo produce groups just over one inch, but the point of aim and point of impact were less than a half inch apart, at least at 50 feet. This young lady had no trouble controlling the KZ with 230-grain fmj ammo despite having to slightly adjust her grip. The gun is in full recoil, with an empty case clearly visible. Her grip is slightly altered on the KZ (thumbs held lower) from the grip she uses on her personal single-stack 1911, but she was able to control the gun during firing. 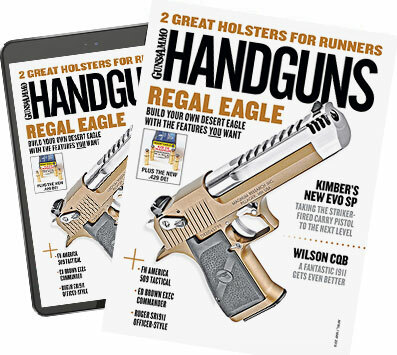 Running neck-and-neck with the 200-grain lead semi-wadcutter loads in accuracy but printing about one inch lower was Hornady's 230-grain jacketed hollowpoint load. The most notable achievement, particularly for a combat weapon, was the KZ's ability to keep 10 rounds of mixed ammo ranging from 200- to 230-grain bullets inside two inches. I could feel a slight difference in recoil between the different rounds (or at least I thought I could), but the gun gobbled up everything and functioned without a single stutter or glitch. For some time, the objective part of me has appreciated the utility of polymer handguns, but not one of the models or brands I've handled has touched the inner me or made my heart skip a beat. That has changed a bit since working with the Wilson KZ. The polymer frame doesn't compare aesthetically with a steel or aluminum gun, but it's attractive enough that I can't make myself refer to it as plastic. The physical interface between hand and gun was good enough that I felt there would be no loss of capabilities or fatal hesitations/stutters if my nervous system reverted to autopilot, an event that regularly happens in moments of stress. With its 10-round magazines that can be loaded to full capacity without undue stress on fingers and thumbs, the KZ offers some serious advantages in a defensive carry gun anywhere hi-cap (more than 10-round) magazines are banned, such as here in California. Even where hi-cap magazines are allowed, the ease of loading the 10-round magazines and their total reliability make the KZ competitive with a gun that carries a couple more rounds. The only thing that keeps the KZ from being my first choice for concealed carry here in California is the difficulty in concealing the wide frame's extra bulk during the months of warm weather we enjoy. Perhaps if I get used to a shoulder holster, I might change my mind. Certainly, the KZ is the quality kind of handgun that would make me reevaluate my carry preferences. Imagine getting all that Wilson quality and reliability for several hundred dollars less than Wilsons have previously cost.